Mist: Press the "MIST" button, and choose the timer from 1 hour/3 hours/6 hours/steady on. Long Press the "MIST" button,you can hear one beep sound, mist mode is high, Long Press the "MIST" button again,two beep sound, mist mode is low. Light: Press the "LIGHT" button to turn on the LED light, and 7 colors will change automatically. HIGH/LOW: Press the "HIGH/LOW" button to adjust the strength or weakness of the spray. ESSENTIAL OIL DIFFUSER:The Aroma diffuser is made of environment friendly PP + ABS material with natural. This decorative piece can be easily fitted to any living space such as bedroom, living room, yoga room, and office. Adding several essential oils into the water, the scent diffuser will release lovely aroma and mist to refresh the air quality. LARGE CAPACITY :500ml water capacity that can continue use up to 12 hours each time.Waterless auto shut-off. Once the water runs out, it wil be auto shut-off to protect the device. ULTRASONIC TECHNOLOGY: This diffuser is extremely quiet when working.Safe around children and the entire family , not a flame burner or hot steamer. Get a calming, restful therapeutic sleep tonight. 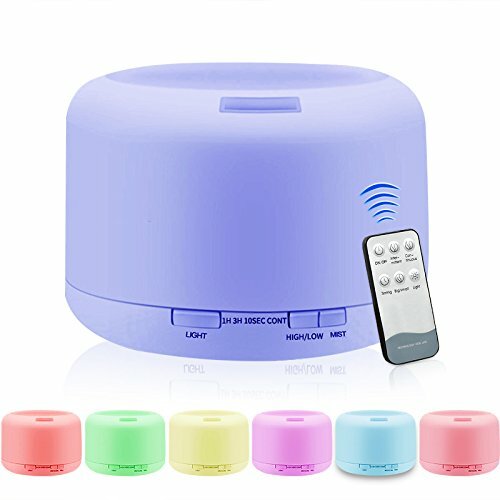 7 COLOR LED LIGHTS: Aroma Diffuser with 7 Changing LED Lights, each of which is adjustable between Bright and Dim modes.Place it on a desk, counter, dining table, or tabletop for an awesome decoration and also produces amazing lamp lighting. AIR HUMIDIFICATION:Helps Purify and Humidify the Air and improves the quality of the air we breathe. Provides moisture for Dry Cough, Sinus Irritation, Dry Skin.prevent stuffy air and flu/cold germs infecting your loved ones. If you have any questions about this product by Fritas, contact us by completing and submitting the form below. If you are looking for a specif part number, please include it with your message.